Luke Walton did not stay unemployed for too long before Vlade Divac and the Sacramento Kings snatched him up as their new head coach. The Sacramento Kings have not gone to the playoffs in 13 seasons. The Kings hope that Walton can finally guide their young team to the first postseason berth since 2006. It was a weird week for the LA Lakers. First, Magic Johnson abruptly quit without informing anyone, including Lakers owner Jeannie Buss. Then, LA Lakers fired Luke Walton after a 37-45 record this season. He finished with a 98-148 record over three seasons. Expectations were very high this year in Los Angeles with the addition of LeBron James. However, once LeBron went down with a groin injury on Christmas, the season was doomed. The Lakers got off to a slow start at the beginning of the season. Magic Johnson and Luke Walton had a heated conversation, which many speculated would lead to a mid-season firing. Magic assured everyone that Luke Walton would remain the Lakers coach for the rest of the season. Everyone knew the writing was on the wall. Walton was not handpicked by LeBron, so his days were numbered. With Walton out in LA, the obvious choice for the Lakers will be Ty Lue. LeBron persuaded the Cleveland Cavs to install Lue as his puppet head coach. To Lue’s credit, he helped the city of Cleveland win its long-awaited championship. The Cavs fired Lue after a horrendous 0-6 start of this season. The Sacramento Kings have a young and exciting team featuring De’Aaron Fox, Buddy Hield, and Marvin Bagley III. The Kings scored a lot of points by running an up-tempo offense. They were on the playoff bubble for part of the season before they ran out of gas. The Kings GM Vlade Divac fired Dave Joerger the day after the season ended. The move was a surprise to many insiders because Joerger did a great job with a a 39-43 record. The 39 wins were the most from the Kings in over a decade. Divac turned to Walton to coach the team. 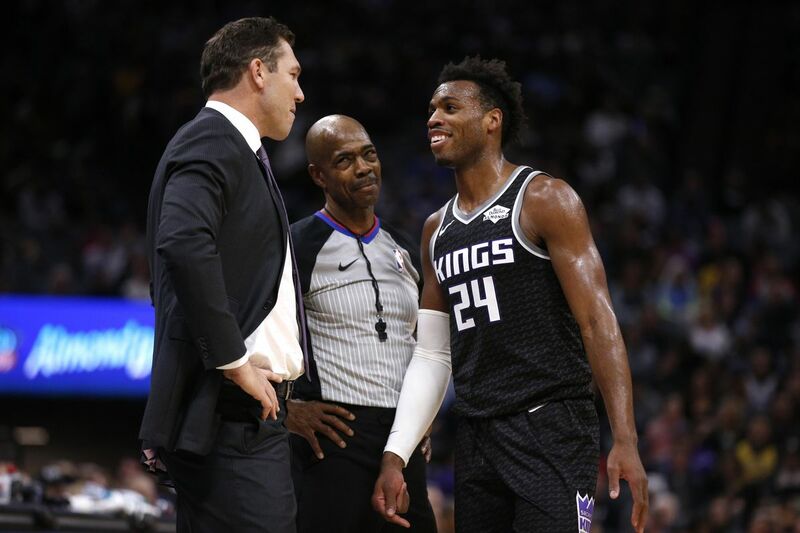 Walton will be tasked with getting the Kings into the playoffs for the first time since Divac played on the team back in 2006. Luke Walton played his collegiate basketball at Arizona under the legendary coach Lute Olson. In 2002 as a junior, Walton averaged 16 points per game as a second team All-America team. The Los Angeles Lakers drafted Luke Walton with the 32nd pick in the second round of the 2003 NBA Draft. Walton played 11 seasons in the NBA, mostly as a reserve with the Lakers for nine seasons. Luke ended his career in 2013 after two seasons with the Cleveland Cavs. During his nine-year stint with the Lakers, Walton won two NBA titles. He learned Tex Winter’s triangle offense under Lakers head coach Phil Jackson. After Walton retired from the NBA, Steve Kerr hired Walton as an assistant coach with the Golden State Warriors. Kerr had back surgery in 2015 and Luke stepped in as interim head coach for the first half of the season. Walton led the Warriors to a record-setting 24-0 start. By the time Kerr returned to head coaching duties, Walton’s Warriors were 39-4. Bill Walton named his son Luke after his former teammate Maurice Lucas. The two won a championship with the Portland Trail Blazers in the 1970s. Bill Walton is a passionate fan of the Grateful Dead. He might not be the most famous Deadhead, but he is certainly the tallest and most recognizable. Luke also has an extreme passion for music, including both hip hop and the Grateful Dead. Luke and Bill Walton are one of three father-son duos with NBA championships. His father Bill won titles with the Portland Trail Blazers and Boston Celtics. Bill played his collegiate ball under John Wooden at UCLA. For a hot minute, Luke Walton was on the short list of potential head coaching candidates at UCLA. Rick Pitino was also interested in the UCLA job, but the Bruins hired Mick Cronin.